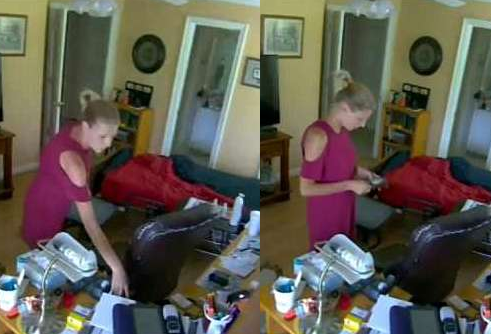 Local Douglas Police confirmed they would be investigating Ms Heather Weldon after she was caught on surveillance camera taking money out of the wallet of a 94-year-old Navy veteran while he was showing her family his home. The mother-of-two is seen entering with her children and an unknown man into the confused old man’s home and as he shows them around, she is caught on camera stealing $40 from Mr Thomas Hendrix, a 94-year-old Navy veteran. In the full video, Ms Weldon can be seen pretending to use the bathroom but instead, she goes immediately to Mr Hendrix's wallet and steals $40 while everyone is in another room. Police admitted they found Ms Weldon when she responded to the surveillance video posted to Facebook.